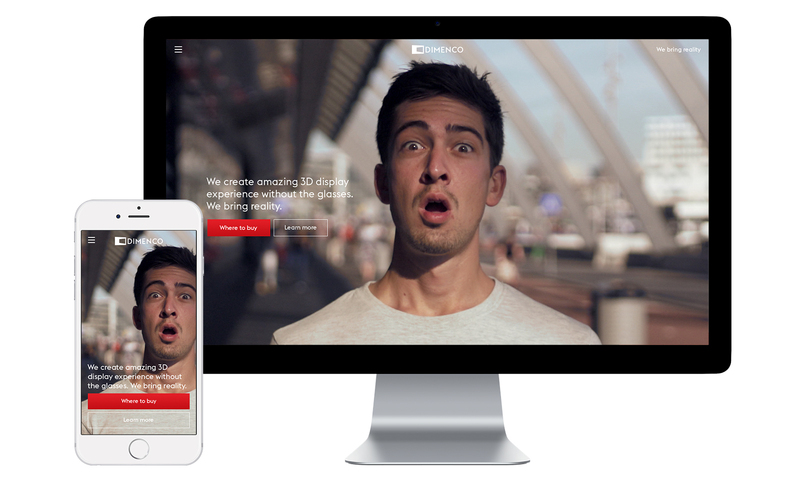 How to use the emotional impact of a product to achieve authentic representation of your brand values? Since its founding in 2010 in Veldhoven, the Netherlands, Dimenco has become the leading technology company in the world that brings excitement and reality to your home. Dimenco is recognized as a world market leader with high-quality award-winning products. Dimenco's products are unique on the market. They are no ordinary displays: they bring excitement and new experience of reality with world-class quality. 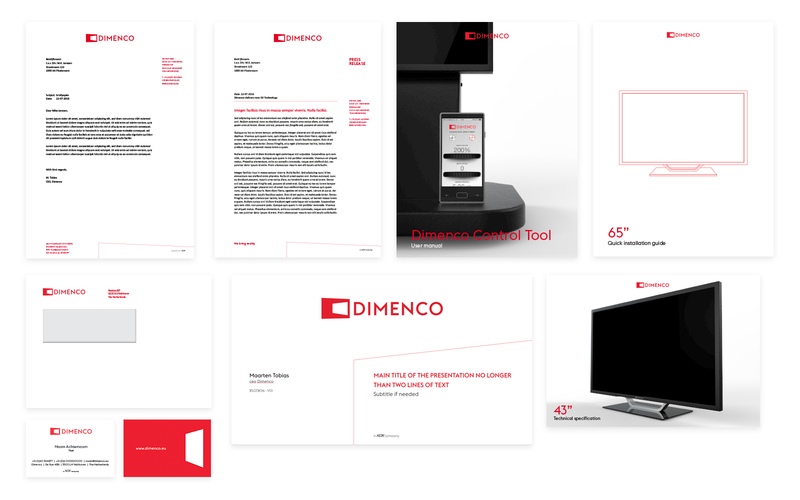 In order to communicate Dimenco’s values in an engaging manner and present their products in a professional way we audited the current visual identity and marketing materials to outline a framework for the development of the new identity. The approach we took was one of evolution, rather than revolution. One of the first things we focused our attention on was Dimenco's existing logo. The route from the old, door-alike logo, to the new one took only as little as a small rotation of 45 degrees. That immediately transformed the mark from being a door, to a screen, with a door inside. A perfect metaphor for the ambition and proposition of Dimenco: to bring and render reality more real than ever. After careful research and analysis and based on the spirit and energy of the team at Dimenco, we made the existing red color more energetic, bright and contemporary. Yet it is very well balanced and mature, in a way that reflects the growing experience of the company. And since good typography is essential for clear and focused communication, we selected a new corporate typeface: Euclid Flex by the renowned Swiss Typefaces foundry. The geometrical construction of Euclid Flex creates the feeling of pragmatism and reliability, but with its alternative characters and spontaneous curves, this typeface gives a strong idiosyncratic voice. One of the most important questions we asked ourselves was how can we communicate visually the astonishing effect that Dimenco displays creates. That happened through a very simple, but profound idea: to visualise the emotional reaction of the viewer, from the perspective of the display. 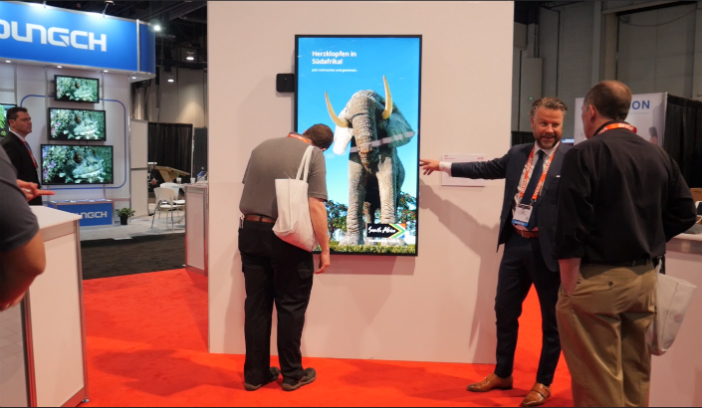 By rendering the powerful moment of surprise which the viewers experiences with the Dimenco displays, this simple approach goes far beyond any 2D depiction of 3D technology on the market and achieves a very personal and authentic representation. The primary goal of the new website was to communicate the proposition of Dimenco and to give very basic product information. 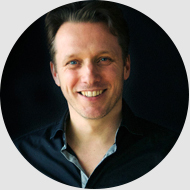 With that in mind, we focused on the user experience, which is less about technology and products, and more about the company values. 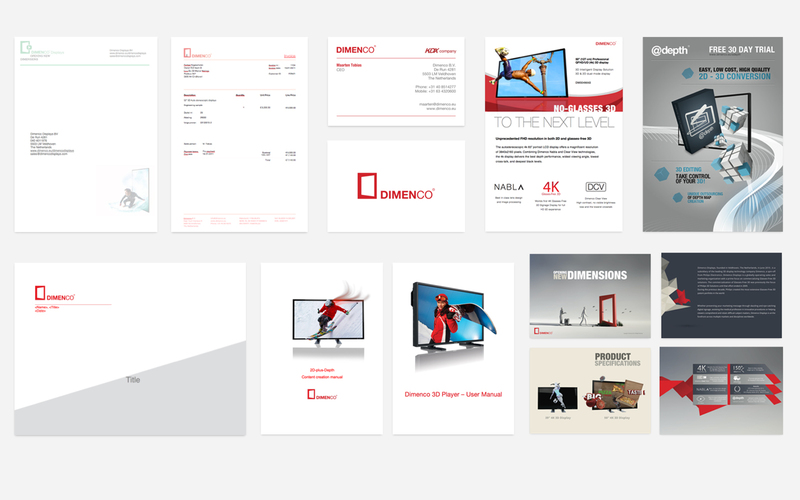 The look & feel for the corporate communication and product materials was established as minimal, with prevailing white, generous margins and using the red only as a accent color. Are you ready for the Dimenco experience? 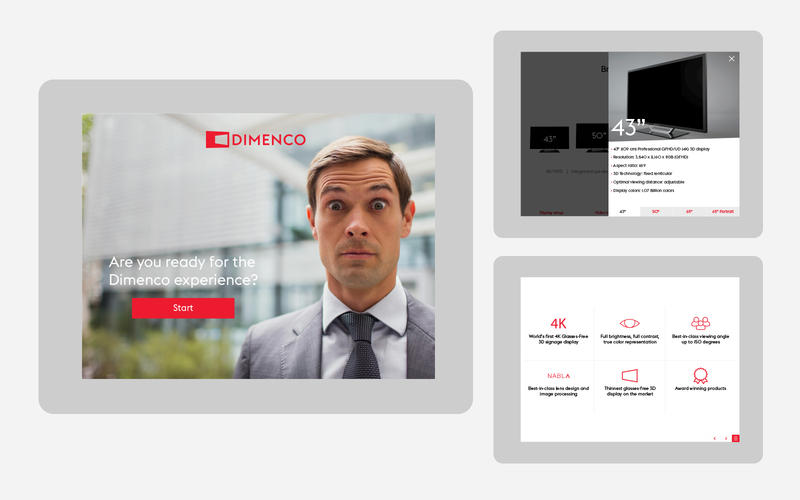 In partnership with Dimenco, we developed an interactive sales presentation, a sales tool to help Dimenco’s sales representatives to tell the story and proposition of the company in a simple and engaging manner, whist highlighting the most important aspects. Our role in this process was to help not only from design, but also from editorial perspective, and help create a very clear and consistent narrative.